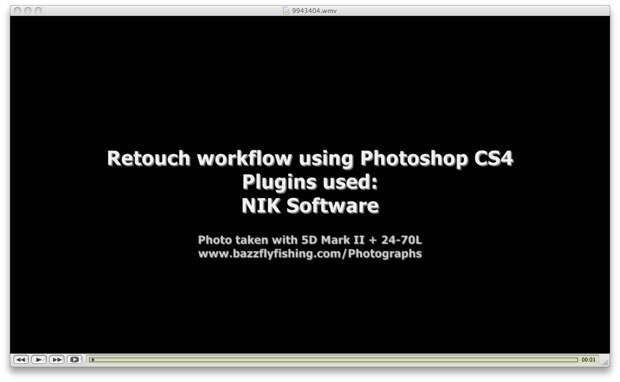 Check out the links in SageTCR’s (bazzflyfishing.com) forum post to a video showing how a portrait RAW image is processed and edited in Adobe Photoshop CS4. If you follow the Vimeo link and register for a free account, you’ll be able to download the original 10:59, 88.2 MB WMV file. Adjust overall Exposure and Tone Curve in Camera RAW. How to apply the Graduated Filter effect, and fine-tune the exposure in Camera RAW. Apply Pro Contrast and Output Sharpener (with selective sharpening) adjustments. The Cross Processing effect was also applied, with a Layer Mask to dial down the effect for some portions of the image (this was the most interesting part of the video for me). These are available from the Color Efex Pro 3.0 plugin by Nik Software. Create a Soft Light layer and use the Brush Tool to enhance the eyes. Use the Patch Tool to fix flaws and blemishes in the image. Reduce noise using the Neat Image plugin. Apply global and local Levels adjustments using a Level layer.